GOOD ART MAKES THE WHOLE WORLD, and everything in it, into art. When you leave a gallery and can’t tell whether the piles of traffic cones outside are a streetwork or not, then the show inside must have been a “good” one. However, this porosity of art boundaries can be a problem, especially for the artists. They’re urged by everyday proximity to and belief in art (at least in their own art) to artify everything within their ken. Think of thousands of Blanche Duboises encircled by a galaxy of bare bulbs. So a few have decided to make the most of this involuntary tendency and work the space around them. While some, like Christo, lay claim to geographic and public space, others, for reasons drawn equally from the walls of Altamira and Alcatraz, begin closer to home: with home. 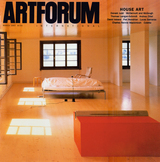 Order the PRINT EDITION of the March 1997 issue for $17 or the ONLINE EDITION for $5.99.